Mark these dates in your diary! If you would like more information, or if you would like to volunteer at any of these events, please contact Noreen O’Donnell (07867505486). 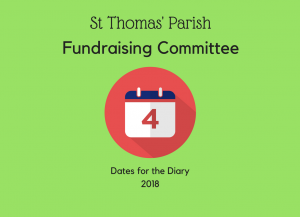 Keep an eye on the parish bulletins, website and Facebook Page for more information as it is made available. Remember that you can purchase a plaque for our Memorial Garden for £75.